Cost Versus Performance – Are Off-The-Shelf Optics Always The Best Solution? Typically off-the-shelf lenses are manufactured for the mass market where unit cost is the dominant driving force. 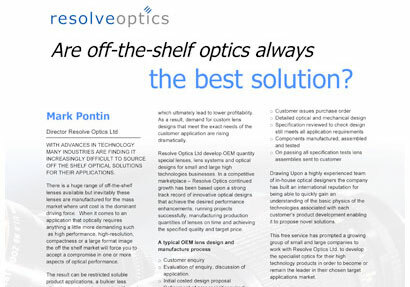 However when it comes to an application that optically requires something a little more demanding such as high performance, high-resolution, compactness or a large format image the off-the-shelf market will force you to accept a compromise in one or more aspects of optical performance. The result can be restricted product applications, a bulkier less attractive product, short product life and loss of competitive advantage – all of which ultimately lead to lower profitability. As a result, demand for custom lens designs that meet the exact needs of the customer application are rising dramatically.